Interior 6 in. BEADED STARS - plain. BEADED STARS design on Exterior - 2.5 in. tall with pedestal. 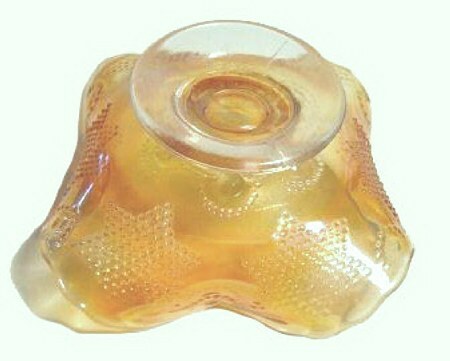 BEADED STARS: The mold for this neat little sauce dates back to the opalescent period predating introduction to carnival glass. Several shapes are shown in a 1908 Butler Bros. Wholesale Catalog. (Click into Fenton – Part 15 to view.) 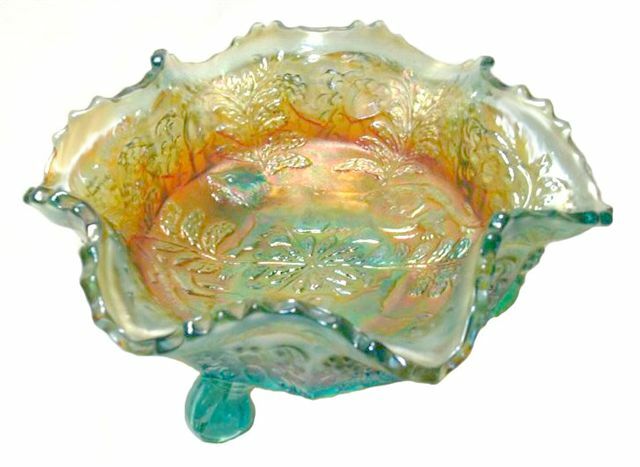 Since they are so scarce in today’s world, we must believe that very few were produced in marigold carnival glass…..(the only color known.) Not given much credit, they usually sell for less than $25. 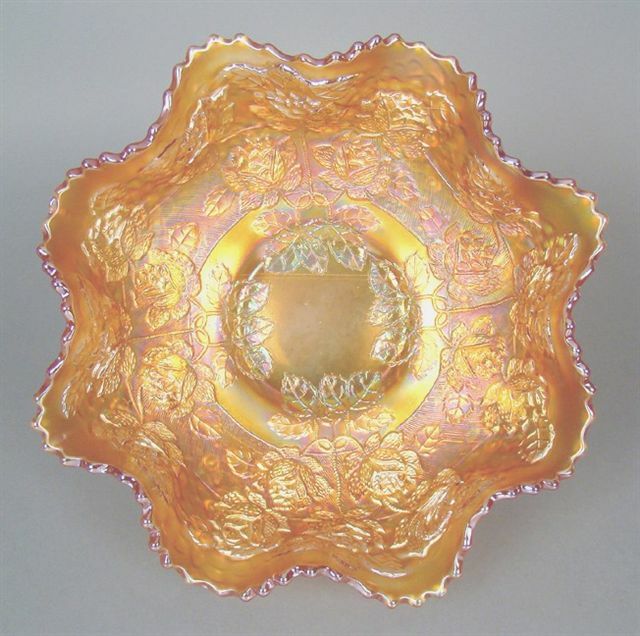 The rose bowl shape offers the clearer view of the pattern. 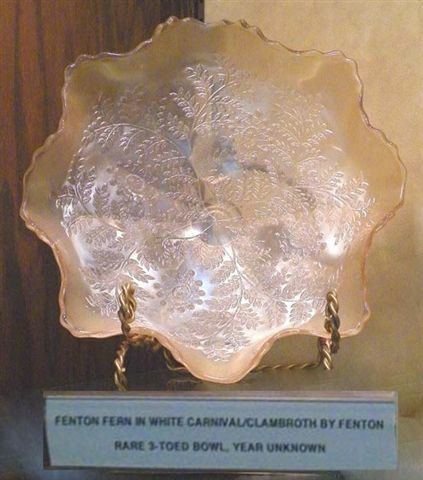 FERN Bowl in Fenton Museum - White - Clambroth. This bowl, the known blue and marigold pieces in this pattern brings the total known to three (currently)! First known Blue opal DRAGON & LOTUS. 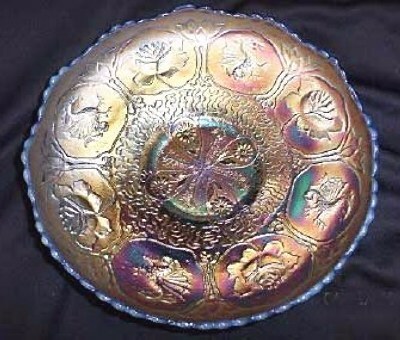 DRAGON and LOTUS in Blue Opal: Ardonna purchased the ice cream shaped example about 1996. This ruffled example surfaced in 2010. ILLUSION - BLue - Courtesy - Greg Cox. ILLUSION: The design appears only on this bonbon shape, making it a sheer delight for a pattern collector. 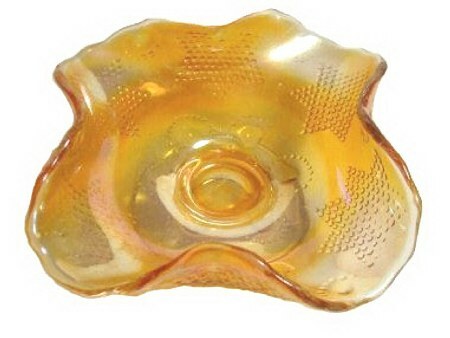 Marigold is the only other color known and it can be seen in our segment: Carnival Glass Edges. 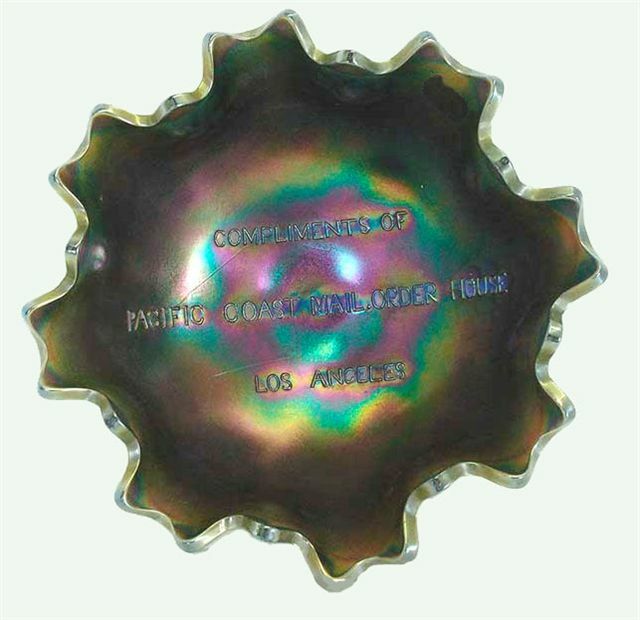 It is a 7” size, but a production date is unknown. PACIFIC COAST MAIL ORDER HOUSE in Blue. Sold for $3600. Seeck Auctions - June -2010. GRAPE and CABLE Exterior of PAC. COAST MAIL ORDER. 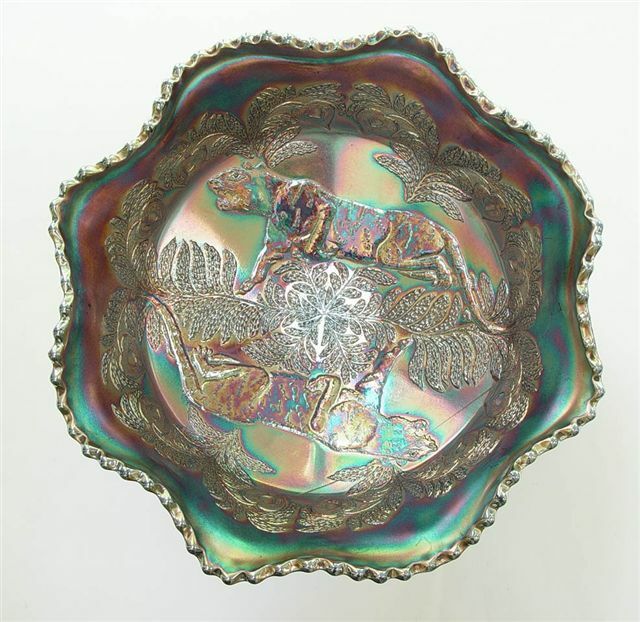 PACIFIC COAST MAIL ORDER HOUSE (Grape and Cable): First and foremost, the large fruit bowl, which was utilized as the basis for these few blue and marigold examples carrying said advertising. Two of the blue ones are perfect, another is cracked. There are possibly four known in marigold. Prices have ranged from $2,000-$3300 over years from 2004-2009. A cracked blue one brought just $500. They are among the rarest of the advertising patterns. 5.25 inch PANTHER Bowl in Aqua. Butterfly & Berry Exterior Pattern. PANTHER 9 in. 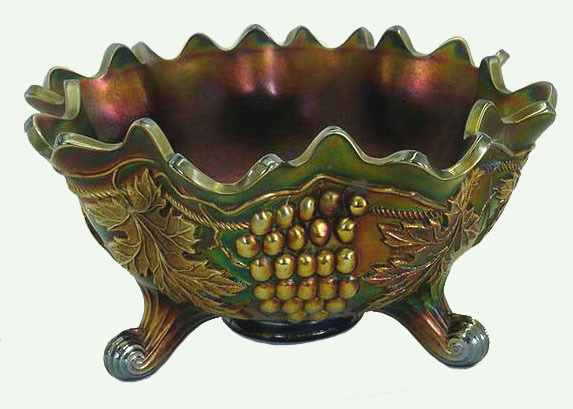 Berry Bowl in Very scarce green. PANTHER-9” size: Blue and marigold examples dominate the color scheme. One 9” size in Nile green slag is known. Only 2 green have sold since 1997, along with 1 aqua (1996) and 1 in amethyst (2009). A couple of white have sold in recent years and olive green is a known color. PANTHER-6” size: Along with colors listed for the larger size bowls, there are variations in red, amberina and reverse amberina available in this smaller size. ROSE TREE - Marigold - Courtesy Remmen Auctions. ROSE TREE: Much as we would like, we can find no recorded trace of this design in the Butler Brothers Wholesale Ads, or in Fenton Glass -The First Twenty-Five Years. A blue ruffled bowl can be seen in our segment: Scarce Bowls by Fenton. Marigold and Blue 9 ½”-10” collar-base bowls are the only known shapes and they are extremely difficult to locate! 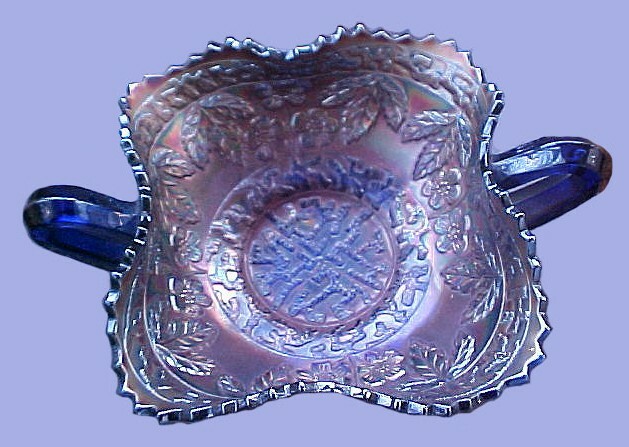 Blue IC shape sold in 1993 and 2002, Blue ruffled bowls sold in 1996, 2005 and 2009. Marigold examples sold in 2005, 2006, and 2009. Now that is rare! 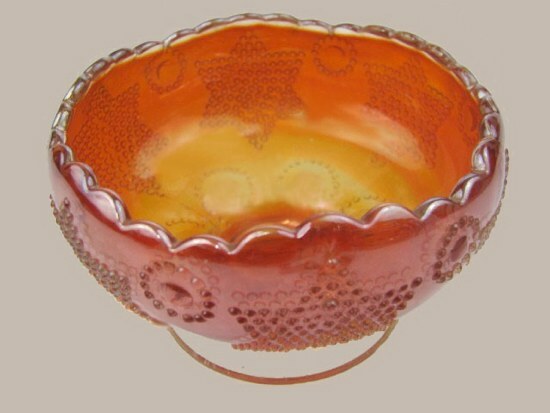 1910 Detroit Elk Commemorative Bowl in RARE Marigold. 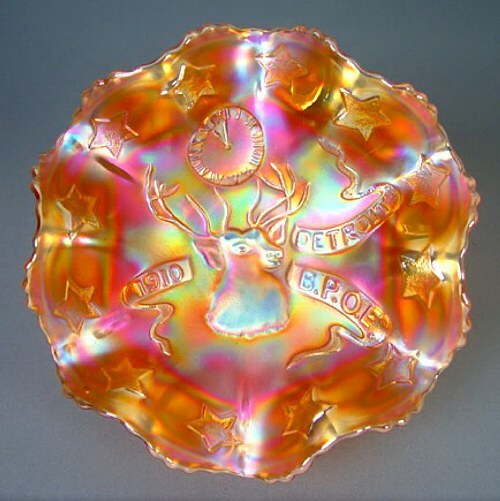 1910 DETROIT ELK: There are two known 7” marigold bowls in this Commemorative. One recorded sale was $9000 in 2008. The one which sold in Aug. 2011 for $4000 in a Wroda Auction had been in the Rinehart collection for many years. This should be considered extremely rare in the field of lettered Commemoratives. Are not two sparrows sold for a copper coin? And not one of them falls to the ground apart from your Father’s will.